Essaouira, 모로코의 다르 셰헤라자데 | 호스텔월드에서 예약하세요. Dar Cherazade is a nice place that offer you 24 hours reception, airport transfers and outdoor terrace. The breakfast is included. Free WiFi throughout the house and telephone with possible incoming calls, so you can join the home landlines. During your stay, Youness, living Essaouira has always organizes a charming on-site team that will support you whether for organizing excursions or other business ideas, he speaks English, Arabic, French. 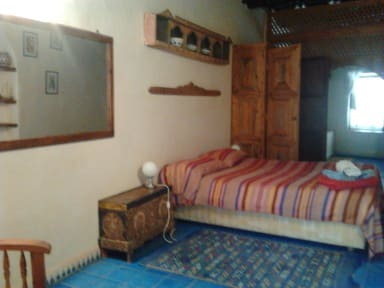 Dar Cherazade can comfortably accommodate up to 15 people, has five bedrooms, all independent suite, and therefore ideal for a family, group of friends or for one or more couples. All rooms Unlimited access to all public areas:lounges and terraces, only the result remains suite with its own terrace.